Casseroles seem to fall into two categories, the fancier type that Mum would serve up to guests and the basic ones she would make for family meals. This recipe falls into the second category, it’s really just meat and vegetables, but great to just put in the oven and forget. Today I make this sort when I have time and reheat when needed. 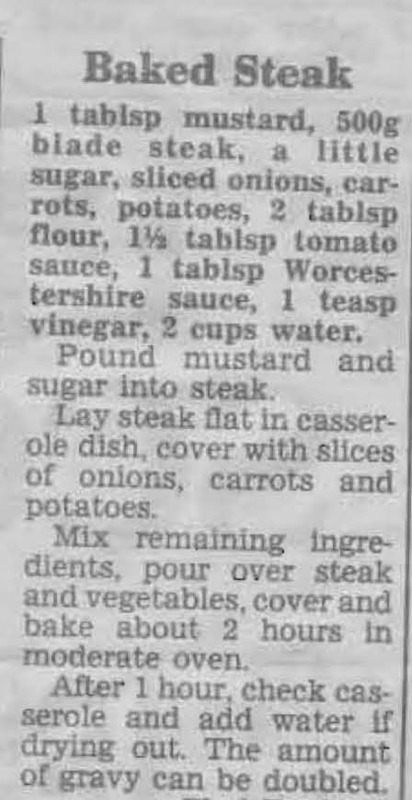 This entry was posted in All Recipes, Beef, Main Dishes and tagged 1990s, baked steak, beef casserole, carrots, Casseroles, potatoes by bebsrecipes. Bookmark the permalink.